The letter’s signers have pledged to do “everything within our power to make sure all of our fans, crews, and fellow artists feel safe and welcome, wherever we go.” This statement comes in the wake of ongoing response from the artist community in North Carolina, stemming from passage of the anti-transgender HB2 law. Signers include Alicia Keys, Amy Poehler, Ariana Grande, Bon Iver, Britney Spears, Cyndi Lauper, Emma Stone, Ewan McGregor, Ilana Glazer, Janelle Monae, Jennifer Lawrence, Jimmy Kimmel, Juanes, Julianne Moore, Kesha, Lady Gaga, Laverne Cox, Rita Ora, Sara Ramirez, Sia, Sting, Talib Kweli, Tatiana Maslany, Tegan and Sara, Troye Sivan, Wilco, Zoe Kravitz, and many more. 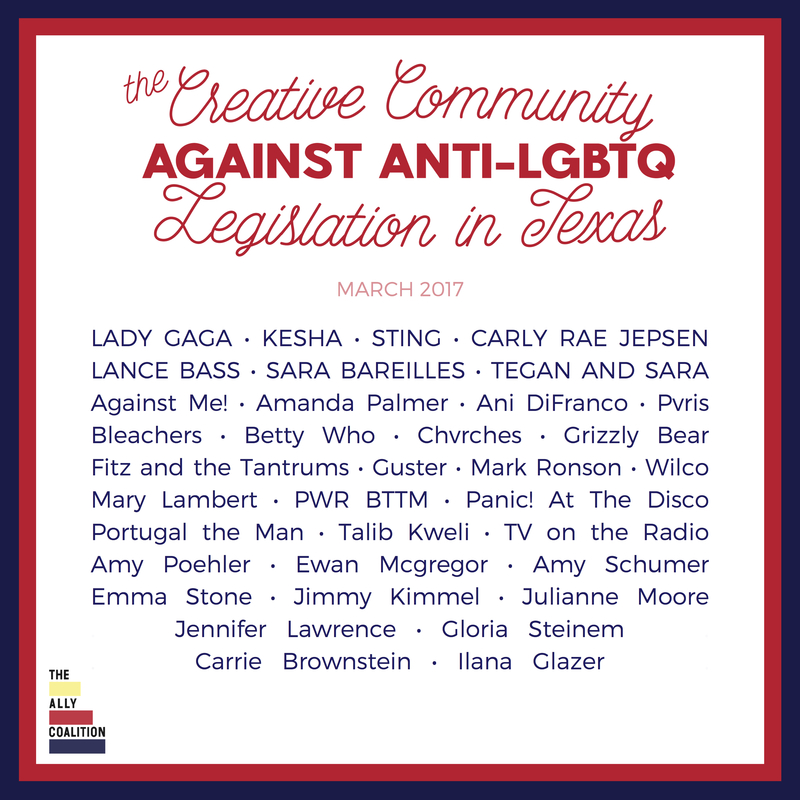 Signatories with Texas roots include Sarah Jaffe, Girl In A Coma, Natalie Maines, St. Vincent, FEA, and Guster.The letter was circulated by Equality Texas, The Ally Coalition, and GLAAD. For updates and a full list of signatures, see www.TXTogether.org.